Hi! So sometime last week, before I got sick, I went and did some urban sketching in the town. 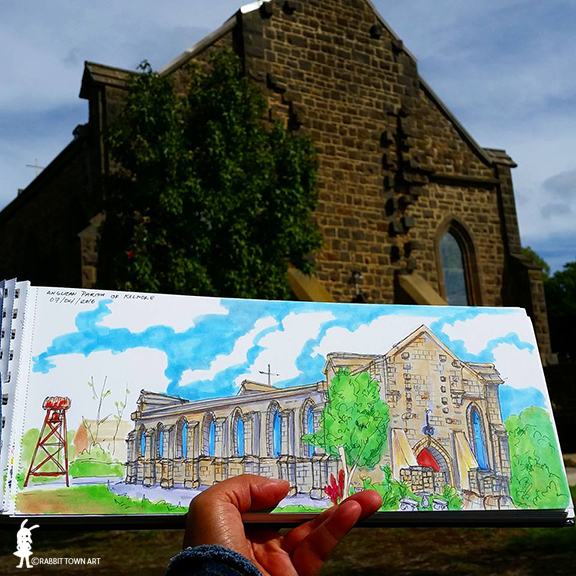 I drew the Kilmore Anglican parish! It was a lot of fun and I got to wander around the town a bit. It's a nice little town. I spent today at home again. I did some baking, chores and finished another drawing. I baked some very fudgey brownies. I want to start a new drawing tonight too. We shall see. I may have left it too late. I am about to do some cooking too! Rob was too tired to drive to the groceries and I didn't go earlier cos the stuff I want to get is on the heavy side....not normally a problem but I'm trying to avoid sweating while am still recovering. Anyway, am cooking corn beef with rice! Emergency food ration time. All this while watching My Kitchen Rules. Hehehehe!